QUESTION: Do you have preferences or consider fashion in the hunter ring like stylish attire (trendy coat colors), headgear or tack? 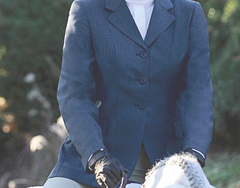 Hunter and equitation attire have their origins in the fox hunting field. Nowadays, trends in coat colors, helmet styles and saddles become fashionable. While entries are being judged on ability rather than on personal attire, the components of neatness, cleanliness, tack and outfit all punctuate the overall picture. The judges comment on their preferences.